Maybelline New York Colossal Kajal Super Black with light absorbing pigments, this formula delivers 2 times more blackness for double intensity. Enriched with oils this formula brings you super smooth application, it glides effortlessly and evenly to define perfect eyes. Smudger Brush: Perfect for that smoky eye look , It is a soft, slightly fluffy brush , tapered for easy use.Smudge shadow/Kajal by using small, controlled strokes while pressing the tip against the lash line. Eyebrow Grooming Brush Essential for well-defined beautiful Brows. Brush the eyebrows up and outwards to create a neat shape. Use comb to groom the eyebrows. Additional Information : A world renowned cosmetics brand, Maybelline New York is known for its scientifically-advanced makeup formulas, revolutionary textures and up-to-the minute, trendsetting beautiful makeup products that are affordable and make you look effortless and stunning. With Maybelline, it's all about empowering women to make a statement and explore new looks each day! Explore the entire range of Kajal available on Nykaa. 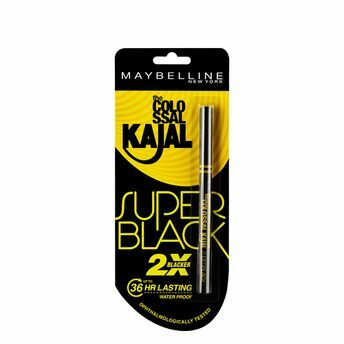 Shop more Maybelline New York products here.You can browse through the complete world of Maybelline New York Kajal .